I'm still working on the Easterling warriors and it seems like it's taking me forever to finish them. I started in late December but the work got put off due to Christmas, visiting family, friends, etc. I'm using the same color scheme that I chose for the previous batch of Easterlings. Painting red has always been time-consuming, especially when working on a larger number of minis at the same time. I always need to use several layers of paint, especially on the final highlight if I want to get a solid color. 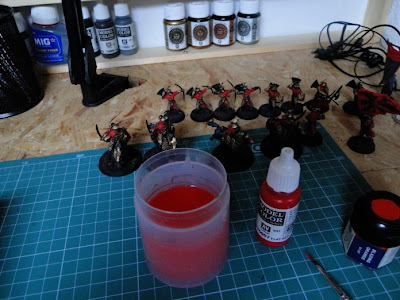 I typically use Mechrite Red (GW's foundation paints are a blessing!) to start off. This is followed by Vallejo (Game color) dark red (I cannot make out the exact name as it is hardly visible now but it's close to GW's Red Gore). This is highlighted with a 50/50 mix of Dark Red with Vallejo (model color) Flat Red. I finish off with several layers of Flat Red put on the protruding elements/layers of clothes that stick out. It's a fast method that gives a relatively nice result. The number of layers between the undercoat and the final highlight depends on how much time one wants to spend on a mini. While working on a single "character" model I also use black to fill in the recessess (for example here or here). It would probably be much easier with Andrea Red set - I'll think about buying it soon. Anyway, here's how my workspace looked like yesterday. Since then I've moved on with the work and started working on the banners (my favorite part here as they give a chance to make a mini pop out nicely). I want to finish them by the end of the week and then work on some orcs. OK, a nice little song to finish off thhis post. I use this one as an alarm signal. It starts slowly and becomes louder after a while. I'm usually awake after first few seconds so it works for me.